Have you ever noticed that good marketing content has become a lot more engaging lately? It’s almost as if we’re not only looking at content, we’re experiencing it. There’s actually some truth to that, and it’s all thanks to the rise of gamification in marketing. Games and marketing may sound strange, but they’re actually a match made in heaven. Visitors have fun interacting with their favorite brands. Companies increase customer engagement. Everybody wins. Ready to learn more? Read on to learn about this hot marketing strategy and how it can be used to convert. What Is Gamification in Marketing, Anyway? Gamification is when you apply techniques and concepts from games to your marketing strategy. And, even if you’ve never heard of it before, you’ve probably experienced gamification at some point. Remember when McDonald’s and Hasbro came together to create a fast-food Monopoly game? That’s gamification. Those concepts can be actual games, trophies, or even points. The idea is that marketing content that mirrors games is better at engaging visitors. Does gamification work, though? Let’s look at its benefits to find out. Gamified content makes your sales funnel better. It’s engaging, so people remember it. This, in turn, creates greater brand awareness. Customers start to think more about your brand, which gets them curious. They subscribe to newsletters, buy one or more of your products. All of a sudden, you converted a visitor into a customer and it’s all because of gamified marketing. After using points and badges to gamify their website, Verizon Wireless boosted browsing time by 30% among half their users. Gamification helped Volkswagen China’s crowdsourcing project go viral. As a result, they garnered over 33 million hits and nearly 120,000 ideas submitted. Ford Motors increased sales by more than $8 million and boosted Facebook likes by 600% with gamified content. Now, back to our initial question. What are the benefits of gamification in marketing? It increases customer engagement. That reduces the likelihood that visitors will scroll past your content. We call that “banner blindness” and it’s a real problem. Conversion rates skyrocket as visitors become motivated to complete tasks for reward. That reward could be a cool badge or trophy, points, or a special feature. Brand awareness and brand loyalty increase as visitors interact more with your content. Games are a lot of fun. Want to exceed your sales and marketing goals? Gamify it. It’s actually one of the most effective ways to growth hack your eCommerce business. What makes gamification so appealing to the average person? For starters, most examples of gamification in business are interactive. And who doesn’t love interactive content? Think about all the times you’ve come across gamified content. If you’re like most people, you clicked it just to see what would happen. It’s hard not to. Games make everything better. 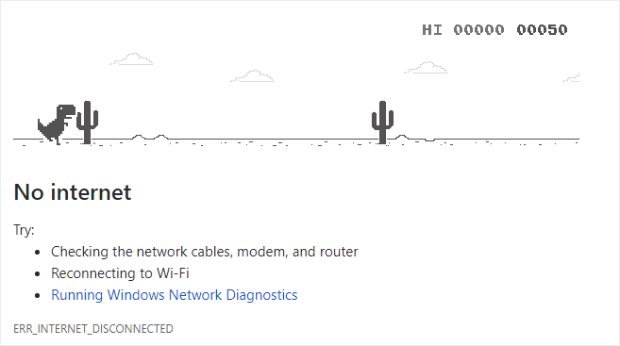 After all, how irresistible is the minigame in Google Chrome that pops up every time a website times out? 81% of marketers believe interactive content is more attention-grabbing than its static counterpart. 88% of B2B marketers plan on converting 10 to 30% of their material to interactive content. Roughly 70% of marketers believe interactive content is successful at converting visitors. In short, people enjoy interactive content and they enjoy playing games. Gamified marketing combines the two. It gives visitors a unique experience that doesn’t exist in traditional marketing. Even something as simple as badges can motivate people to do more. Check out the picture below to see how Dropbox used cute badges to get their marketing team to reach target goals. And guess what. It works! People want to feel a sense of accomplishment. When they complete each task, it feels like they’ve achieved something great. Additionally, gamified marketing makes customers feel like they’re in control. They get to choose how they interact with your content. This adds a whole new layer of fun and excitement that isn’t often available elsewhere. Sold on gamified marketing? Great! Let’s look at some examples of how you can bring it into your own marketing campaigns. You may be thinking this sounds too good to be true. There must be some kind of catch, right? Gamification isn’t some secret that only top companies know about. You don’t have to be a game developer for Nintendo to use it. It’s actually very easy to weave into your current marketing strategy. 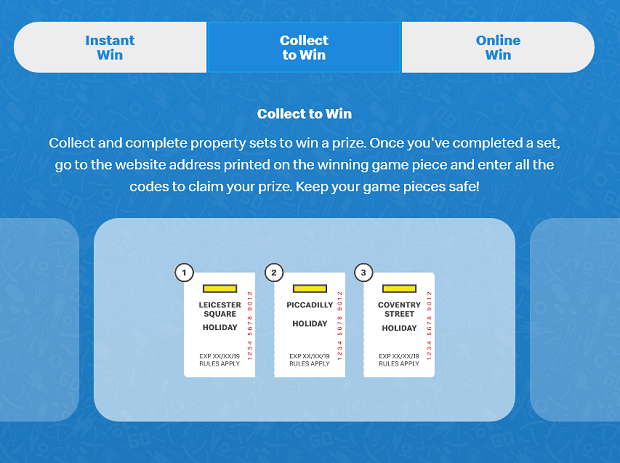 Below are our favorite gamification examples in sales and marketing anyone can use. 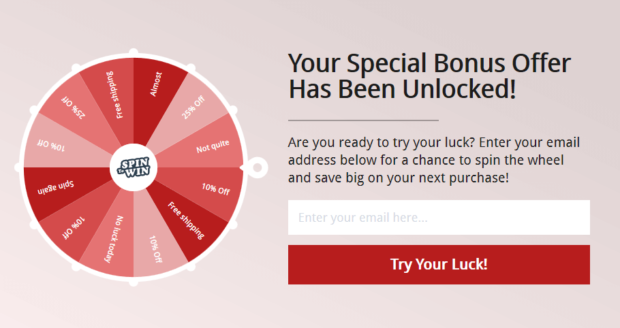 The spin-to-win discount wheel turns lead generation into a fun game that visitors love. That’s because it gives them a chance to earn rewards by giving contact information. Moreover, the spin-to-win optin stands out. It’s fun and unique, so visitors are less likely to ignore your popups. And that’s great for reaching your conversion goals. What’s more, you have complete control over the wheel’s setup. You choose what prizes you want to give and how many wheel slices to include. You can add anything from discounts to special offers and free shipping. 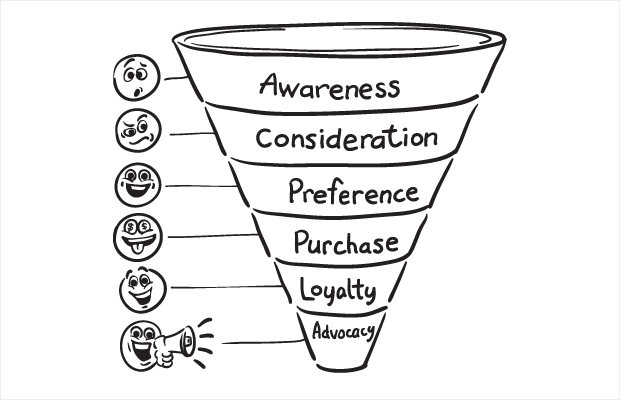 This converts visitors into leads and encourages them to finish their purchasing journey. Because, if they’ve earned 25% off a product, they might as well go ahead and buy it. 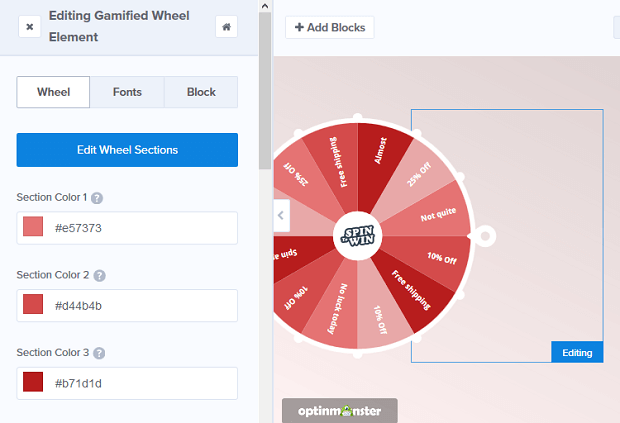 Use OptinMonster to integrate our ready-made wheel template into your marketing campaign. Feel free to use it as is, or customize your wheel any way you see fit. Then, watch your conversion rates skyrocket with a few clicks of a button. Look at how easy it is to customize rewards on your discount wheel with OptinMonster. The completeness meter is another great gamified element that’s straightforward and effective. Google, Dropbox, and LinkedIn have all used completeness meters in their marketing campaign. The example shown above is LinkedIn’s meter, in the form of a progress bar. The goal of this meter is to get the reader to complete all steps on a particular journey. In the case of LinkedIn, that journey is fleshing out your profile. When you add a picture, work history, your location, education, and so on, you complete the meter. And when you complete it, you get a trophy. Getting visitors to complete questionnaires and service quotes. Sending customers down every step of the purchasing journey. Having visitors complete an optin for your mailing list or event. Are you an eCommerce site on WordPress? Creating and implementing a progress bar only takes a couple of minutes with the help of WPForms. Gamifying progress has never been easier. Badges are one of the most popular types of gamification. They’re seen everywhere, from Ebay’s star rating system to Facebook’s trophies for top fans. Students taking online learning courses. Customers in eCommerce loyalty programs. The Khan Academy created a wide range of digital badges for students. They can earn a new badge after completing a task or earning a set number of points. Naturally, it worked like a charm. Students were motivated to do more than complete assignments. They actually wanted to collect badges to show to their peers. Supporters who share your content on social media. Brand ambassadors who onboard friends and family. Loyal customers who spend a lot of money on your services. In other words, any task that goes above and beyond what’s expected is something you can reward with a badge. Best of all, creating badges isn’t as hard as you think. The WordPress plugin BadgeOS lets you build an achievement program with badges in minutes. No need to burn the midnight oil coming up with a comprehensive set of badges like the Khan Academy’s. Ready to Level up Your Marketing Skills? If you want your brand to last the test of time, you have to keep up with customer expectations. Many customers value enjoyable experiences, which is as important as the product itself. It’s up to you to deliver those experiences in your marketing campaign. Fortunately, you can do that with gamified content that makes your optins fun and engaging. You can give your marketing strategy a mega-power boost with OptinMonster’s smart lead generation tools. OptinMonster has everything you need to create gamified content that promotes growth and engages visitors. Imagine being known as the brand with awesome optins. With OptinMonster, you can. Brandon Harville is a content writer who specializes in Inbound Marketing and Consumer Behavior, and how it all ties into eCommerce. When he’s not writing and learning about the latest MarTech developments, he likes to spend his time hiking and watching YouTube cooking videos.